Ron Pratte’s extensive car collection, including cars and automobilia, is selling at the Barrett-Jackson Auction in Scottsdale, AZ. We have previously offered an exclusive look at his collection on this website. Our friends at Barrett-Jackson have just announced that they are expanding their auction dates to accommodate all the vehicles. The auction in Scottsdale, AZ will now start on Saturday January 10th, with portions of Pratte’s automobilia being sold from Saturday January 10th through Tuesday the 13th. Traditionally the auction house starts each morning with some automobilia but his extensive collection obviously requires more lots and time. Usually car sales don’t start until Tuesday. Pratte collected a massive amount of cars and they are auctioning off his cars on Tuesday January 13th and on the “prime time” Saturday January 17th. Saturday afternoon and evening is traditionally the ONE day for the most anticipated vehicles, (like the Batmobile) selling at the highest prices. 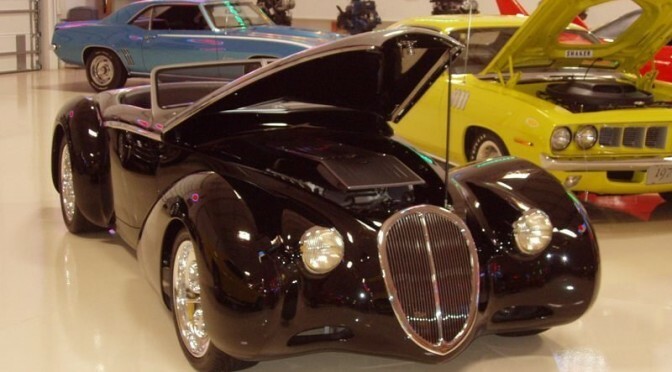 Pratte’s collection includes some historic vintage cars, many built by highly regarded fabricators like Boyd Coddington and numerous cars he bought whose proceeds went to charity. In fact he often bought a charity car and then re-donated it back so it could be auctioned off again. Several of his cars are selling, with the proceeds going to specific charities, that he always has supported. Looks like Barrett-Jackson week just got longer. Will you be attending? BMW Art Car -Worth the wait for #18 ?